Since the onset of the crisis in 2011, at least 400000 people have been killed. The top spenders are responsible for 75% of global military spending $1.7trillion (2011). The USA accounts for 41%. 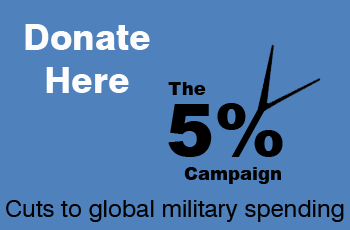 NATO countries (the US, Europe and the UK) accounted for 70 per cent of the global military expenditure. Europe has 7% of the world’s population and 20 per cent of global military expenditure (TNI). The Permanent Five nations on the Security Council (USA, Russia, China, UK and France) and Germany account for approximately 80% arms sales – all this while their role on the Security Council is to keep the peace. Over 900 million people in the world are hungry; 1.5 billion people subsist on less than US$1.25 per day. Furthermore, over 40% of people in the world live on less than US$2 per day. And this is not just confined to the global south – 40 million Americans are on food stamps in 2012. One aircraft carrier ($5 billion) = reforesting an area three times the size of Costa Rica in the Amazon ($300 per hectare). The F-4 Phantom Fighter burns more than 1,600 gallons of jet fuel per hour (just three hours of flight uses as much fuel as the average driver does in one year of driving) and peaks at 14,400 gallons per hour at supersonic speeds. US arms giant Lockheed Martin tops the list, selling $35.7bn worth of arms in 2010; the second biggest is the British company BAE Systems – it sold $32.9bn of arms, which is around 95 percent of the company’s total revenue that year; Boeing is third with $31.4bn, which is around half of its total sales for the company most famous for its commercial airliners. Northrop Grumman, the world’s largest builder of naval vessels, is fourth with $28.2bn; General Dynamics is fifth with $23.9bn. In 1998, the Brookings Institute carried out an ‘atomic audit’ of the US nuclear weapons programme from 1940 to 1996. The estimated total costs are $5.5 trillion. Similar studies about the nuclear spending of the rest of the world are unfortunately lacking, but the International Peace Bureau estimates the global annual total is around $90 billion.